EPF Member Passbook contains the contributions made by employees from their monthly salary and the matching employer contribution in epf and eps accounts. You can read how Epf Contributions are calculated in my other post. You can also find how much interest amount credited to your provident fund account. In case you have multiple pf accounts or member ids, you can find all these ids inside the login section. To view and download epf passbook, you need to register on UAN Member Portal. You can read my previous post on UAN Registration. Follow the instructions provided to learn how to register for epf passbook. Once you register, you have to wait for 6 hours to view your passbook online. However, Passbook facility not be available for the Exempted Establishments Members / Settled Members / In Operative Members. In this post, you will learn how to download epf member passbook and how to read the passbook. Lets get started. Once you register on UAN member portal, you can use the username and password to view and download the passbook. As i already told you, you have to wait for 6 hours to download the passbook. Now lets see how to download Epf UAN Passbook in step by step manner. Step 2: On the left side of this page, you can find login form. Enter your UAN Number in place of username and the password you set on unified member portal. Finally enter captcha and click on login button. See the following screenshot for reference. Step 3: Now you are logged into the passbook viewing page. On the left side, it will display the member id. If you have multiple member ids, it will display all of them. Step 4: Now to view passbook, Just click on the member id that you want to download passbook. It will display all the transactions made since you joined the organization. The pdf file will be displayed as follows with establishment id, member id, office name, employee share and employer share. Step 5: You can download this pdf file by clicking on download button that you find on top of the display screen. Please refer to above screenshot for better understanding. Now you have downloaded your epf member passbook statement which you can also print for future reference. You can see the print option in above screenshot. Annual Interest Credit – Interest will be credited on annual basis at the rate prescribed every year by EPFO’s Central Board of Trustees after consultation with the Ministry of Finance. Epf Withdrawal Amount – You can also find the withdrawals made from provident fund account in this passbook statement. The date and time of printing passbook will be displayed at the bottom of the page. Pension contribution column that you find in epf passbook is the amount contributed by your employer. Your employer contributes 12% of basic plus dearness allowance. Out of this 12%, 8.33% goes to pension account i.e., Employees Pension Scheme (EPS) & 3.67% will be credited to EPF account. Example: Assume Basic and DA as Rs.15000. 12% of 15000 is Rs.1800. Out of this Rs.1800, Rs.1250 goes to EPS account, whereas Rs.550 will be credited to EPF account along with your contribution of Rs.1800. You can find more information in my Epf contribution post. 1. I Forgot EPF Passbook Password – How to Reset Password? 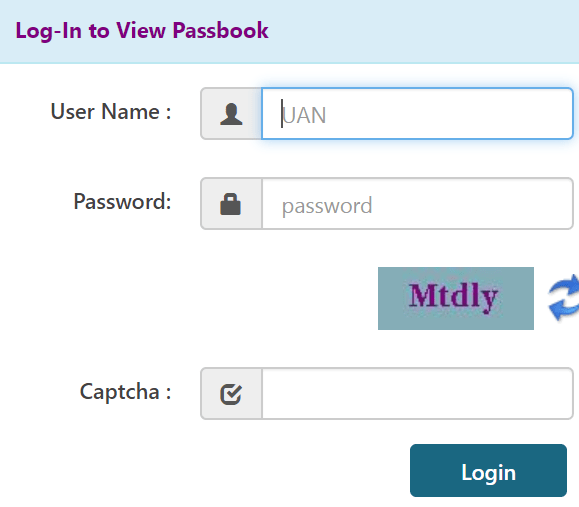 Ans: If you have forgot epf passbook portal, you can reset it on unified member portal. Please read my previous blog post on UAN Password Reset. 2. On which date interest amount will be credited to my EPF Account? Ans: EPF Interest amount will be credited annually on March 31st. 3. Who can download EPF passbook online? Ans: Epf members who are contributing to Provident fund account from their monthly salary can view passbook. Employees of Exempted Establishments, Settled Members & In Operative Members cannot view and download the passbook. 4. When is the EPF passbook generated online? Ans: Passbook will be available after 6 Hours of registration at Unified Member Portal. 5. Do i require a password to open epf passbook pdf file? Ans: You don’t need any password to view the the downloaded passbook. 6. Can I Download EPF Passbook without UAN Number? A. It is not possible to access EPF passbook without using UAN Number. By default, your UAN Number is the username for the portal. Hence, UAN Number is mandatory. You can read my post on How to Get UAN Number, if you don’t know it. 7. How can I track my VPF Balance? It is not showing in EPF Passbook. Ans: An employee can voluntarily contribute more than 12%. One can contribute up to 100% of basic plus D.A. This is called Voluntary Provident Fund (VPF). But the employer contribution will not change. It will be 12% only. VPF do not have a separate column to display. It will be added to epf amount and will be shown under employee share column. 8. Why am I not able to see my EPF passbook? Ans: In this case, please check whether UAN Number is activated or not. There should be atleast one month contribution and you should be active member of EPF. 9. Some entries are missing in my EPF passbook. How can I update them? Ans: Its because the concerned person in your office is not making the ECR and contribution properly. Contact HR or Personnel Dept. You can also lodge a complaint with Enforcement Officer PF. 10. In the EPF passbook, there is a column named ‘pension contribution’. Will it be included in my EPF balance? Ans: Employee total contribution goes into EPF. But employer contribution further distributed into 2 part EPF and EPS. It will not be included EPF Balance. If you want to withdraw your pf for that you have to fill 2 forms. Form 19 for your EPF contribution + employer EPF contribution. Form 10c for EPS contribution which is done by employer. This is all about Epf Member Passbook Download via UAN Portal Login. If you still have any doubts regarding this topic, please comment below. I Can Help… Thanks!